This fun and exciting class picks up where Spinning 101 left off. 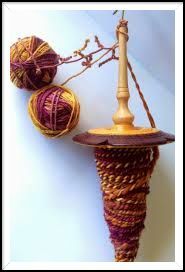 Students should be familiar with spinning terminology and the mechanics of spinning a single ply yarn on a drop spindle. The next step is to take that single ply and turn it into a double, or triple ply yarn to give it strength for knitting, crocheting or weaving! Once plied, we'll cover how to wet finish the yarn and set the twist with a THWACK! Hope to see you there!